Above a photograph of a building known locally as Kenidjack Castle located at the site of an iron age hill fort. 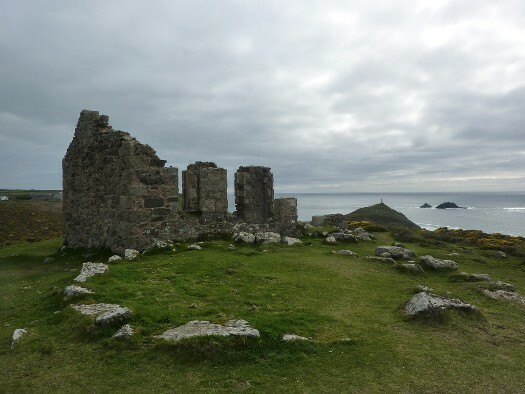 The ruined building was associated with Wheal Castle mine. During WW2 it was used as a guard house for an adjacent military rifle range. Today there was an interesting article by John Stevens a former Conservative MEP on the Conservative Home blog. One of the factors the British Gazette has constantly factored into the equation has been the assumption of the adoption of the instinct of self preservation. It is very strong! Which is why we don’t like to take risks. Some people are prepared to take risks. Thus bringing us to the point where the link between Brexit and Kenidjack Castle is made: Kenidjack Castle is a regular point on my daily walk. One day there was a youth standing on the apex of the end wall looking out to Cape Cornwall and The Brisons beyond. The teenager was taking a huge risk with his life as the site is windy and if he had lost his footing and balance and fallen backwards he would have broken his back or neck and have been in a wheelchair or a coffin as a result. But he was a teenage lad and those of us who have been teenage lads know that we do do stupid things. It’s only those of us who survive this period and reach our adult years that we have cause to reflect on such stupidity! Be under no doubt, were Madame Mayhem to go for a “no deal Brexit”, the consequences for the Tory party are dire! Of course, Doctor Richard North has focused his attention on the consequences on the state of the UK economy! Where the British Gazette differs from the learned doctor is that whereas Doctor North suggests that a “hard Brexit Britain” would be a place of economic hardship and decline in the long term; the British Gazette disagrees inasmuch that we feel that the disruption to trade brought about a “no deal Brexit” would be so severe and so sudden that it would inevitably bring about a collapse of the government, a general election and the possibility of a coalition government dominated by the Lib-Dems. It would also more than likely bring about an offer from the EU for the UK to rejoin the EU on “emergency terms” – which would of course include joining the ERM preparatory to joining the Eurozone and also would likely include joining the Schengen Area. This would have to be brought about by a second referendum. The reason we have not suggested that this is Madame’s “cunning plan” is that this would bring about the destruction of the Tory party! #1: Destruction of the support for Eurorealism and Euroscepticism in the UK. #2: Strengthening of the Eurozone with the inclusion of the UK and the City of London. #3: The City of London emerging as the financial capital of the EU. NB: Many EU member states do not like Germany’s dominance of the Eurozone and would like to see the ECB located in London. #1: a high short term cost to the UK economy. #2: considerable disruptive costs to EU businesses trading in the UK. This of course brings us to the question: Wither the Tory party post a “no deal Brexit”? Well it is fair to assume that the chaos would result in a split. It is possible that the Brexiteers would join UKIP and the Remainers would join the Lib-Dems.